12. The modifying element A is near-identical with the corresponding Egyptian ideogram for 'sky' and is accordingly interpreted to mean 'sky, heavens, pertaining to god' etc. 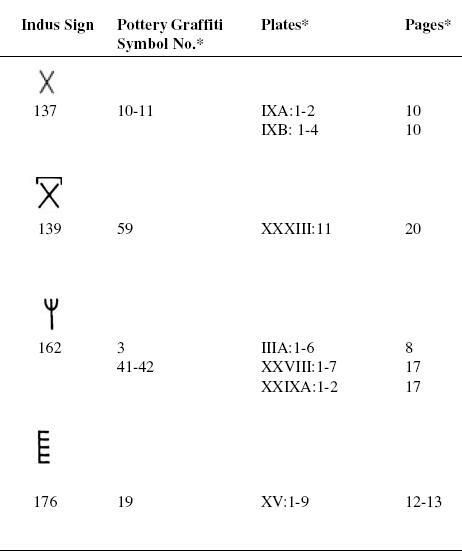 (Fig.5).When the element 'sky' is placed above the basic signs, the compound signs (in the same row in the Chart) acquire the meaning 'god's share of grain or crop'. The concept of first fruits, "the first agricultural produce of a season, especially when given as an offering to God" (Oxford English Dictionary), is familiar to all agricultural societies. Many Dravidian languages have specific expressions for 'god's first share of the produce' e.g., Ma. mittal 'first fruits, offering to demons'; Kod. midi 'offering to a god'; Te. midu 'what is devoted or set aside for a deity' (DEDR 4841). Cf. Ta. mitu-poli 'grain first taken from the grain heap at the threshing floor for charitable purposes' (Tamil Lexicon). 13. The compound sign 139 occurs only on seals, mostly from Mohenjodaro. It is the only sign on a large 'unicorn' seal from Chanhudaro (6131). It would appear that seals with this sign were used by temple functionaries to mark the clay tags affixed to bundles of grain stalks which were set apart as 'god's first share of the produce' at the threshing floor. 14. The compound sign 142 occurs only on the miniature tablets and sealings from Harappa. The function of 142 seems to be somewhat different from that of 139. Sign 142 may depict the voluntary offerings of small farmers or tenants of first fruits to god before further apportionment of the grain. Apparently, the miniature tablets or sealings marked with this sign would be placed on bundles of grain stalks or heaps of grain offered to the deity. 15. The modifying element B consists of eight vertical short strokes arranged in four pairs around the basic signs. The context indicates the meaning 'one-eighth'. 16. The compound signs 140,143 and 164 which mean literally 'one-eighth share of grain or crop' is interpreted as the 'State's share of the produce' from the following evidence. The Pillar Inscription of Asoka at Lumbini, the place of birth of the Buddha, states : lummini-game ubalike kate atha-bhagiye ca. "The village of Lumbini was made free of taxes and to pay (only) an eighth share (of the produce)". (Inscriptions of Asoka, ed. E. Hultzsch, Rummindei Pillar Inscription.) Hultzsch cites Fleet (JRAS 1908: 479) that "atha-bhaga (from Skt. ashta-bhaga) is an 'eighth share' which the king is permitted by Manu (VII: 130) to levy on grains". Apparently, the Harappan rate of land revenue at one-eighth share of the produce continued down the ages and was later codified by Manu and was prevalent until at least the Mauryan Age. In later times, the rate of land revenue varied from place to place . Tamil literary and inscriptional sources mention aril-onru ('one-sixth') as the prescribed rate. The general term for 'tax on land' in Tamil was irai (DEDR 521). 18. The compound signs 138 & 163, combining 'upper' with 'share (of grain) or crop' respectively, seem to have the same meaning, namely, the 'upper share of the produce (due to the landlord)'. The interpretation is suggested by the Tamil literary and inscriptional usage which equates 'upper share' with 'landlord's share' of the produce; e.g. Ta. melvaram 'the proportion of the crop or produce claimed by the landholder' (Tamil lexicon). The term generally occurs in contrast with kuti-varam 'tenant's share' (discussed below). 19. Sign 149 depicts pictorially 'crossroads'. 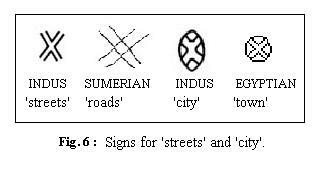 It may be compared with the near-identical Sumerian sign for 'roads'. 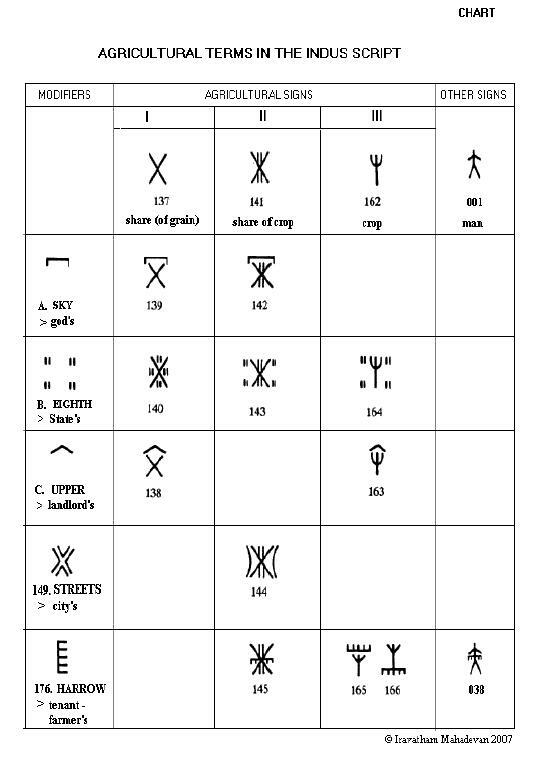 The Indus sign can be interpreted as 'streets' or 'part of a city' when compared with another Indus sign (284) for 'city' which has an exact counterpart in an Egyptian ideogram (Fig.6). 20. The compound sign 144 can be analysed as follows: 'Streets'(149) + 'share of crop'(141) = 'streets' share of the crop'(144). We learn from Tamil inscriptional evidence that a levy known as patika val lit., '(levy for) guarding the streets' was collected from the citizens for payment to those guarding the city or village (Glossary of Tamil Inscriptions). It is quite likely that a similar system of municipal taxation was in vogue in the highly organized urban societies of the Indus Civilization. 21. Sign 176, apparently a toothed implement , is interpreted as a 'harrow'. The harrow symbolises 'cultivating tenant' or his share in the compound signs to which it is added. Note particularly the compound sign: 176 ('harrow') + 001 ('man')= 038 ('ploughman, farmer'). Cf. Ta. kuti, kutiy-al 'tenant' ; Ma. kutiyan 'tenant' (DEDR 1655). Ta., Ma., Ka., al 'man, servant, labourer' (DEDR 399). 22. Sign 145 is interpreted as a compound of 'share' (X-like element), 'grain stalks' (pair of tall vertical lines) and the 'harrow'. The compound sign means 'share of the crop due to the tenant-farmer'. (See Corpus of Indus Seals and Inscriptions, vol.I, M-391 for a realistic variant of this sign.) Similarly, signs 165 & 166 are compounds of 'harrow' (176) and 'crop' (162) with the same meaning 'share in the produce of the tenant'. Compare Ta. kuti-varam 'share of the produce to which a ryot is entitled' (Tamil Lexicon). 23. It is very significant that some of the agricultural signs of the Indus script survived as isolated symbols in the pottery graffiti of the succeeding Chalcolithic and Megalithic Periods (B.B. Lal 1960, Ancient India16: 4-24). The relevant comparisons from Lal's photographic catalogue are listed below. * References to Lal 1960. While Lal has compared the pottery graffiti with similar-looking Indus signs, he has refrained from offering any interpretations. In the light of the present identification of the Indus signs listed above as 'agricultural terms', it is perhaps not too far-fetched to suggest that the corresponding symbols occurring as graffiti on pottery during Chacolithic and Megalithic Periods had the same significance. The survivals lend support to the linguistic parallels suggested in the paper linking Harappan agricultural practices with later traditions. 24. It remains to add some comments on a few points arising out of the proposed identification of agricultural terms in the Indus script. 1. Modifiers: It will be seen that the modifying elements and signs in the Chart modify the sense and not the sound of the basic signs. In other words, the additions are semantic and not phonetic. The modifiers act as attributes qualifying the sense of the basic signs. The Chart indicates that in the Harappan language the attribute precedes the noun it qualifies. Further, it is not necessary that a compound sign should have two phonetic elements; it may be a single word. 2. Signs stand for personal nouns also: The signs listed in the Chart can also be interpreted, when warranted by the context, as the corresponding personal nouns. (e.g.) share > share-holder, share-cropper crop > one who grows the crop, agriculturist harrow > tenant-farmer streets > citizens, municipal authority. Such interpretations are more likely when the signs occur initially or followed by nominal suffixes in the texts. 3. Other Signs: Signs 001 ('man') and 149 ('streets') are not 'agricultural signs', but included in the Chart as they combine with agricultural signs to produce compound signs interpreted as agricultural terms. 4. Frequent Signs in other contexts: The two signs mentioned above (001 and 149) and also the signs 162 ('crop'), and 176 ('harrow') occur very frequently in the Indus texts in other contexts. In such cases, these signs may have much wider, though still related, significance, not considered in this paper. 5. Redundancy of Signs : It will be noticed that signs in the same rows have virtually the same meanings. The redundancy could have arisen at different places and during different periods. Perhaps some of them are not redundant, but have nuances and shades of meanings which elude us at this preliminary stage of analysis. Even after allowing for such possibilities, one is left with the impression that the Indus script, even in its mature stage, appears to be a limited type of writing, comprising almost wholly of words-signs which represent matters of interest to the ruling classes. Such redundancy, as seen even in this limited set of signs, is not expected to be present if the script had reached a more advanced stage as Sumerian or Egyptian. 6. Parallels from other Pictographic Scripts: The parallels cited from Sumerian and Egyptian scripts do not mean that they are related to the Indus script or there had been direct borrowings from them. When picture- signs are drawn from material objects, there are bound to be some similarities even between unrelated scripts. However, ideographic signs from different scripts can be compared only semantically and would have no phonetic connections. 7. Bi-lingual Parallels: The bi-lingual parallels (from Dravidian and Indo-Aryan) cited in the paper are intended to highlight the cultural unity and continuity of traditions, which get reflected as parallel expressions in languages belonging to different families. As mentioned at the outset, the interpretations proposed here are ideographic and not based on linguistic arguments. 8. The Grid: The grid of related signs presented in the Chart has turned out to be a powerful tool for analysis. Even the very rare signs which occur only once (144, 145, 164, 165 & 166) and hence normally un-analysable, have been identified with some confidence because of the pattern brought out by the grid. What is more, one can even predict that the blank squares in cols.I-III in the Chart would be filled up in due course by new discoveries of compound signs which would be combinations of the respective modifiers and basic signs. 25.The Indus script possessed a set of terms referring to crop and share of the agricultural produce. Five hierarchical levels of levies on the produce have been identified, namely those due to God, State, City, land-owner and the tenant-farmer. The most significant information is the discovery that the Harappan rate of land revenue was one-eighth share of the produce which prevailed until at least the early historical period. Burrow, T. and M.B. Emeneau 1984. A Dravidian Etymological Dictionary (Second Edition). Oxford. Englund R.K. and J-P Gregoire 1991. The proto-Cuneiform Texts from Jamdet Nasr. Glossary of Tamil Inscriptions. Vol. I (2002) & Vol. II (2003). Corpus Inscriptionum Indicarum, Vol. I.
Archaeological Survey of India, New Delhi. pottery. Ancient India 16: 4-24. The Indus script: Texts, Concordance and Tables. Corpus of Indus Seals and Inscriptions (abbr. CISI). Vol. I (1987) & Vol.2 (1991). Helsinki.